The longest part of this project is wrapping the balls with yarn. Get going! Wrap around each Styrofoam ball until you can no longer see the Styrofoam. I hold the beginning piece until I wrap around a few times, and then wrap over it to secure it. To finish the ball, I pull the end through a few layers of the wrapped yarn and cut the end. Next, unravel the metal clothes hanger, form in to a circle. Start threading one end of the hanger under a layer or two of yarn on each ball. Once all balls are on the hanger, use hot glue to hold them to one another. Finish with hot glueing decorations to the wreath. Tip: You can use other wreath forms such as a Styrofoam ring. Instead of “threading” the balls of yarn on to the wire of a metal clothes hanger, you would hot glue all balls of yarn directly to the Styrofoam ring or use pieces of yarn to tie them on. 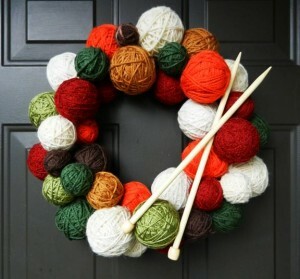 What wreath ideas do you have? For more great craft ideas, check out our Facebook page, Pinterest page or DIY section here!